With so many releases and announcements to come in a few hours, here we are with the products released by LG in Mobile World Congress 2015. In not a very hyped event, LG revealed 6 new products: two pairs of Android Lollipop phones and probably one of the most nicest smartwatch yet to come with LTE connectivity. Long story short, Spirit and Magna are the cousins of G Flex 2. Not so curved as the G Flex, the phones are slight curved which would give bragging rights to some. The 5-inch LG Magna is packed with a 1.2 GHZ quad-core processor, 1GB of RAM, 8GB storage which is expandable via microSD cards, 8MP rear camera, 5MP front faing camera and carries a 2540 mAh battery unit. 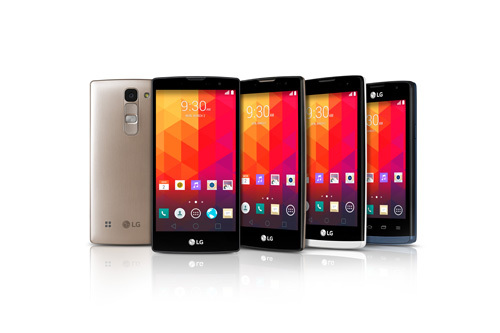 The LG Spirit, on the other hand, is the mini version of Magna as it features a 4.7-inch display. Under the hood, it packs a Snapdragon 410 Cortex- A53 quad core processor chipset clocked at 1.3GHz, 1GB of RAM, 8GB of storage and a smaller 2,100mAh battery unit. Best part, both the smartphones runs on the latest Android Lollipop. Leon carries the old LG tradition of having the hardware buttons at the back and comes with a 4.5 inch display with a very low resolution at 480 x 854 pixels. It comes with a quad core processor, 1GB RAM, 8GB of storage and runs on the latest Lollipop OS. As for Joy, it is the smallest of all the 4. Featuring a 4-inch screen, this devices bears the classic look with no buttons at the back and curves. Christened LG G Watch Urbane, the smartwatch bears a classic look and comes with 3 hardware buttons. After releasing the G Watch R, LG was quiet quick to come up with an updated design. What makes G Watch urbane very attractive is that it’s the first to come with LTE Connectivity and would be offering mobile payments through NFC. It should be noted here that there are two types of Urbane, one sporting the LTE version and the other, a normal one. The LTE Version does not run on Android Wear and is powered by LG’s own wearable platform which unfortunately, doesn’t have a name yet. The non-LTE version runs on Android Wear and uses GVoice instead of Google Now. Identical to the G Watch R, the device features a 1.3’inch P-OLED Display with a resolution of 320×320. It’s powered by a Snapdragon 400 Chipset clocked at 1.2GHz, 4GB of storage, 1GB of RAM whereas the LTE version has additional Bluetooth 4.0 and WiFi. In terms of hardware features, the LTE version has three hardware buttons on the side whereas the normal one only comes with one button. Not a very hyped up event from LG but the G Watch Urbane surely is one product that the competitors would be looking into to fight with in the near future.